LTCG has become a devil for the mutual fund and stock market investors. Investors are confused that they should continue investing in or stop investing and stay away from the market. Many people are approaching experts to get an answer to this question – How to avoid or reduce impact of LTCG? Well, as per me investor can take following steps to reduce impact of LTCG. 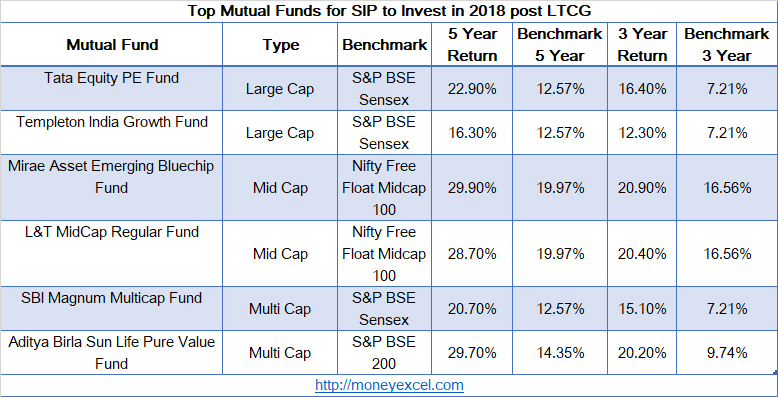 Stay Invested for long term in Aggressive Top performing Mutual Funds like SBI Small Cap Mid Cap Fund or stock like HDFC where you need not to churn your portfolio for the long term and you can avoid LTCG. Make a plan for LTCG every year. Make sure that profit from equity market is distributed every year and it is not exceeding 1 Lakh per annum. Make a strategy not to sell your equity and mutual fund investment unless you are in need of money. Remodify your financial goals considering LTCG in mind. This means you have to consider extra margin of LTCG if you plan to invest in the stock market for your financial goal. Consistent Performance – The first factor is consistent performance. All schemes are selected based on past performance history of 5 years. Type of Funds – Only large cap, small cap, and multi-cap funds are taken into consideration as these funds are likely to give superior returns to the investors. Scheme and Asset Size – Scheme type and asset size is another important factor while selecting funds. All funds selected here are higher in asset size 500 Cr or above. Outperformance with Benchmark Index – Another factor of consideration was a fund which outperformed benchmark index consistently. A simple rule is adopted here. If fund performance is greater than benchmark fund performance is good. If fund performance is less than benchmark fund performance is bad. Tata Equity P/E is very good fund. This fund has given consistent positive returns since past few years. This fund is rated at level 5 by CRISIL. If we compare fund returns with benchmark returns this fund has done extremely well. S&P BSE Sensex benchmark return of last 3 years was 7.21%, whereas this fund has generated 16.4% returns. Templeton India Growth Fund is second large-cap fund for investment. Past performance of this fund is very good. This fund is able to beat benchmark return consistently. In last three years fund has given double return compared to the benchmark index. Mirae Asset Emerging Bluechip Fund is the first fund for investment in Mid Cap segment. This fund is rated at level 4 by CRISIL. In last five years, this fund has given 30% return to the investors. The fund is able to beat benchmark return consistently. L&T Mid Cap Regular Fund is next fund for the investment in Mid Cap segment. This fund has beaten benchmark index since past 9 years. The expense ratio of this fund is low. CRISIL and value research rating of this fund is 4. SBI Magnum Multi-Cap Fund is first multi-cap fund for investment in 2018. Value research rating of this fund is 5. If we compare fund returns with benchmark returns this fund has done extremely well. S&P BSE Sensex benchmark return of last 3 years was 7.21%, whereas this fund has generated 15.1% returns. Aditya Birla Sun Life Pure Value Fund is a multi-cap fund with very good performance. CRISIL rating of this fund is 4.This fund is able to beat benchmark index consistently. Historical performance of these funds is very good that does not mean that fund will continue to perform in the future. You need to keep track of fund performance and review your portfolio time to time. If the fund is not performing for more than one year you can find out the reason for underperformance. If you are not satisfied with fund performance you may plan to exit from the fund. Do you think Investment in Aggressive Funds makes sense after LTCG? Do you think consistent performance of fund is important for you? You are doing a great job. The language you use is so simple and the information so vital. Thanks a lot for your efforts.